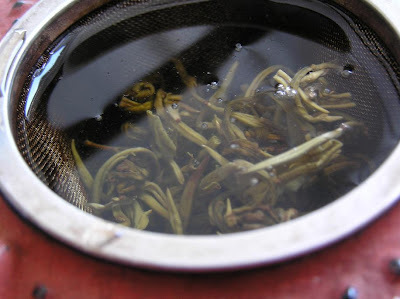 Here are tea-related articles I found most interesting in last few weeks. Timing tea - thoughts about archery, tea and zen. Very good one. Kung Fu tea and Chao Zhou - article full of info about beginning of kung fu tea. Yiwu, Nannuoshan and others - Nadas journey to the land of tea. I'm very sorry for no new posts in last days - I'm admiring the ones like Hobbes or MarshallN (especially Hobbes) who post new article each day. For me it tooks about two hours to write the post down and these days I had less time then I want to have. By the end of March arrives the tea that is one of the most favored in Czech Republic and Slovakia – the Darjeeling’s. This typical Indian tea is harvested from two to three times a year. While the second and third harvest – called second and third flush – are typical light black (red) teas with some floral smell, the first flush is much greener. It’s still black tea, but retains some characteristics of green teas. The fermentation is light leaving the tea green and floral. And today the tea producers following the taste of tea drinkers make first flushes of darjeelings greener and greener. 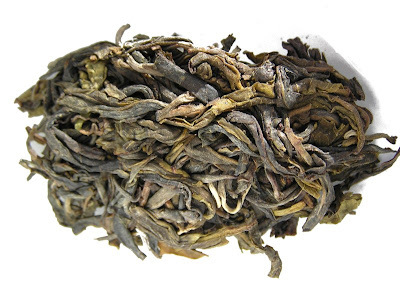 This Darjeeling tea from Thurbo plantation is sold by local vendor tealand.sk for $23/2oz. According to information provided by the vendor, this tea was collected on March 22nd this year from northern hills facing the famous Kangchenjunga. The tea leaves were withered for two days. 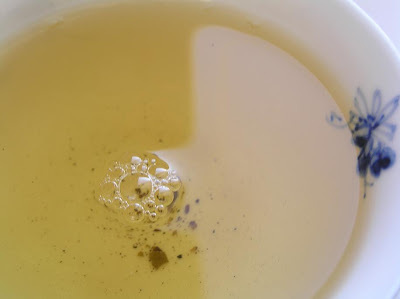 The greenest Darjeeling I tried this year shows lots of hairy tips and nearly non-fermented leaves. The aroma of the dry leaves is very strong, very green and wild. It reminds me of freshly scythed meadow. Please, click the picture to see, how beautiful the leaves are! The liquor is very light, very bright with just a touch of yellow. I prepare this tea with quite cold water (85 Celsius, 185 F) making three or four infusions, first starting at 1 minute and then each subsequent infusion is one minute longer than the last one.The tea is very aromatic with familiar Darjeeling fruity smell and taste – sweet, slightly acidic, hiding the aroma of dried apples and grapes. Actually, even when this tea is sold as Darjeeling tea, I believe that this is white tea made in the area of Darjeeling. I like it a lot; it’s a simple but cheerful companion for warm spring evenings. 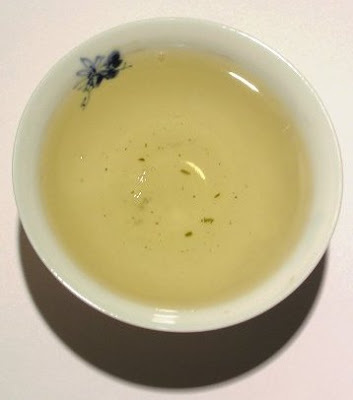 I do not drink green tea too often – mostly because I need a water of certain rather low but constant temperature. Also, I prepare green tea in gaiwan – but I like to use yixing teapot more. And I certainly do not like jasmine teas. The ones I tried before were just too aromatic using artificial jasmine flavor. Not my cup of tea. So when I received this jasmine tea – Dragon Pearls from Hobbes my first thought was to try it and then donate the rest of the tea to some, who can fully appreciate it. Sorry for that, Hobbes. I prepare green teas in my office mostly using very few leaves - just about three grams. I brew the tea in my flat red tetsubin with rather cool water and doing only one long infusion. The reason I decided to keep all this tea to me is its aroma. 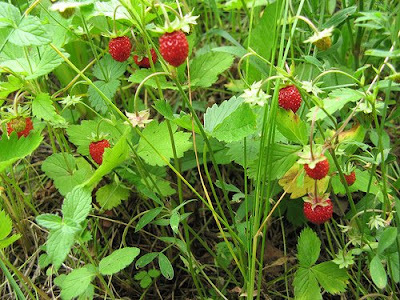 Wild strawberries. I do not know if they grow in other parts of world but here in Slovakia you can find them growing in forests. These strawberries are very small, but the taste of one huge domestic strawberry is concentrated in fruit ten times smaller. I love them and I love this tea. It brings me back memories when as a kid I used to eat those strawberries each spring. 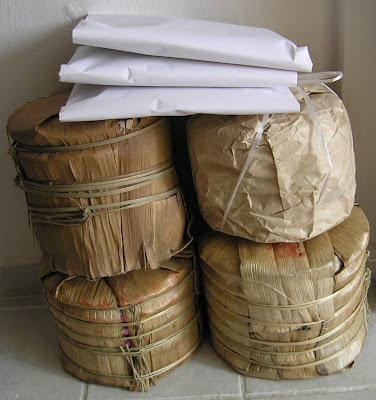 Last few days I'm eagerly awaiting my parcel from HouDeAsianArt – it includes the newest Art Of Tea, some XiZhiHao minibeengs, 2002 CNNP 8582 and some more. Since the parcel has a tracking number I was able to track its position. I was very surprised, when yesterday the status on the tracking site changed to Arrived Abroad To Slovenia. Slovenia is part of former Yugoslavia and is a totally different country from Slovakia. So my parcel is lost somewhere… I hope it will find it’s way back to me. According to legend, Wu Liang was a man, who invented oolong teas by accident by neglecting to dry tea leaves promptly. But Wu Liang is also a mountain in Simao region where mao cha is harvested for producing pu-erh. This 100 gram only xiao (small) beeng is of private production using pure sun dried mao cha and traditional processing. 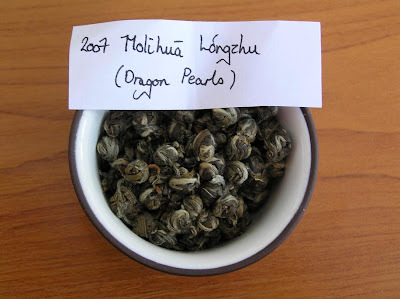 I got a sample of this tea from owner of www.longfeng.cz – the 2003 Wu Liang pu-erh is one of his exclusive selected teas. As it’s clearly visible from the leaves, the compression of this minibeeng is very loose; it’s probably stone-molded. 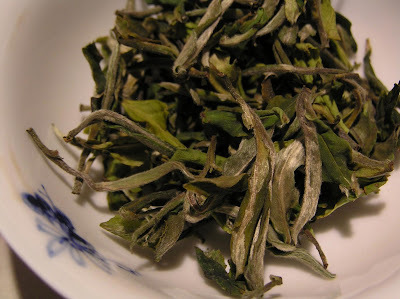 Also, the tea is nearly five years old, but from the color of leaves and their smell I can deduce, that it was stored in dry environment all the time. There are mostly green leaves with few tips. When I prepared this tea for the first time, I used boiling water. The brew was yellow with some chemical smell; the taste was heavy and sharp. I definitely disliked the tea – it’s certainly a good candidate for aging because of the strong taste, but I like somewhat more gentle teas to drink right now. Since I got a sample only, I couldn’t let this tea age. So next time I prepared it with only 90 Celsius (194 F) water. First two infusions were somewhat smoky, but smokiness dismissed in third infusions and citrus aroma showed up. This tea actually tastes like tea should – the taste is very pleasant, full and round, filling the whole mouth leaving very long fruity sweet and slightly acidic aftertaste. Using the cooler water this is a very good drink-me-now tea, but thanks for the power of mao cha it is made from it’s also a good candidate for aging. From 5 grams I made 10 very good infusions and I have to admit, that I gave up earlier than the tea. Since my appartment is very dry, I decided to move part of my pu-erh stash to some more rural conditions for the summer. These teas will be stored in my parents shed - the 2 feet thick solid rock walls, partly embedded in the mountain uphill with pretty high humidity may accelerate the aging process. I included some beengs I have at home, so I could compare the different aging of the same beeng by Christmas. I'm very interested to see what will the more humid storage do with the extremely floral Da Xue Shan.